Their relationship has involved duck hunting, ballroom dance lessons, and most things in between. So when it came time to a marriage proposal, John Ludwig wanted to do it in a special way. "When you get engaged," he explained, "the first thing people ask is, 'How'd you do it?'" He knew he didn't want to throw the ring box on the dash of a car and ask "How 'bout it?" He figures it took him three months to decide on a way. He was in a restaurant with his fiancee, Julie Olsem, listening to the radio when inspiration hit. The lyrics of a song mentioned "a knight in shining armor" and he decided to propose in medieval fashion. So last Monday, Nov. 1, on their one-year anniversary, John lured Julie to their 40-acre property west of town, by telling her he was having a driveway installed. When Julie arrived, several vehicles were there, but she was confused because there wasn't any machinery and no one seemed interested in a driveway at all. John approached her on a horse, wearing a full suit of armor. She admits to laughing when she first saw him on the horse, but she quickly got serious when he dismounted and started to read a poem. "I read through the whole poem, and then I got down on one knee and asked her to be my wife," said John, who had to tape the ring inside his helmet because he had no pockets. "After about the third line, I realized what you were doing," she told John during their interview for this story. "It was awesome." She cried a little, smiled a lot (she said her face hurt afterwards from smiling so much), and hugged John before he was done. Julie said she immediately answered, "Yes! ", using a loud, clear voice to mimic her reply. According to John, she replied affirmatively with a smile but with her hands clenched to her face and tears streaming down her cheeks. 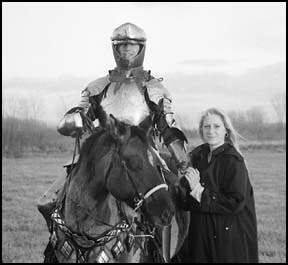 To make the romantic proposal possible, John had to arrange to rent the suit of armor and a horse. He found the suit of armor on the Internet, at a Twin Cities company that makes vintage armor by hand. The suit he rented was a 15th Century Italian model that allowed a full range of motion (because it was handmade) and weighed about 60 pounds. Riding horses was not recommended but Mike Flanders had a horse he trusted to carry a noisy rider. Still the horse did not like the clings and clangs as it carried John. Everything went well except for the weather, which was nice the previous weekend but was cold and windy for the proposal. Despite the elaborate preparations that John successfully handled for his proposal, Julie said he would not be planning their wedding by himself. So far, they've decided on a wedding next August or September. They're planning to hold the service at St. Boniface Catholic Church in Cold Spring, where Julie works as the director of music and liturgy. She is a native of Dundee, near Fulda, Minn., and graduated from St. Benedict's College in St. Joseph. They met at that church, which John first attended for his nephew's baptism. They were introduced two weeks later. "That'll get everybody interested in going to church," said John, a graduate of Paynesville Area High School who now programs computer-controlled equipment and provides technical support at Louis Industries. "I'd say you'd find the good girls in church." Reactions to their engagement have ranged from total excitement to expecting it to loving John's creative approach, they said. Trying new things is normal with this couple. Julie shot her first two ducks this fall and will be going deer hunting for the first time. Sometime soon they will go on an air balloon ride together. "We go to great lengths to make each other happy," said John. "We get an idea," he added, "and we just go do it." With that attitude, imagine the possibilities for a honeymoon.